Families with a child, birth to five, can join a supportive community and learn everyday, fun activities to help build their child’s reading skills! There will be a Story and Craft Hour, for ages 2+ in the library while parents attend a discussion and activity session. Older siblings are welcome in the library during the program. Participants will receive free books and prizes each week! Lunch will be provided. Two special events will follow two of the sessions: an apple picking trip the first Saturday, October 7, and a Halloween party October 28 at the library for families who attend the program. To sign up for High Five! email brenda.shufelt@hudsonarealibrary.org or call 518-828-1792 x101 or stop by the desk at the Hudson Area Library. This event is free and open to the public and is wheelchair accessible. 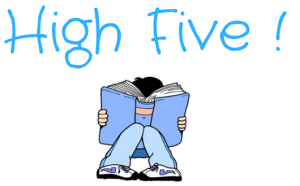 The Greater Hudson Promise Neighborhood is thrilled to be partnering with the library for High Five! The GHPN works to support children and families in the Hudson City School District from birth through college to career. 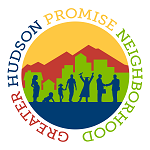 Promise Neighborhood, established in 2011 through a Planning Grant from the US Department of Education, has built a strong foundation of partnerships and programs supporting families in the Hudson community and beyond. This entry was posted in Adults, Children, Programs and tagged children, early literacy, family by Brenda Shufelt. Bookmark the permalink.